If you're constructing a home bar, the dimensions for height, depth and width are important considerations for optimum functionality. A bar is all about relaxation and entertaining friends, so height plays a big role in the comfortable placement of bar stools. Proper depth and width of the counter space will allow room for drinks, snacks and the number of people you want to be able to gather at one time. You can construct a home bar in many shapes and sizes. 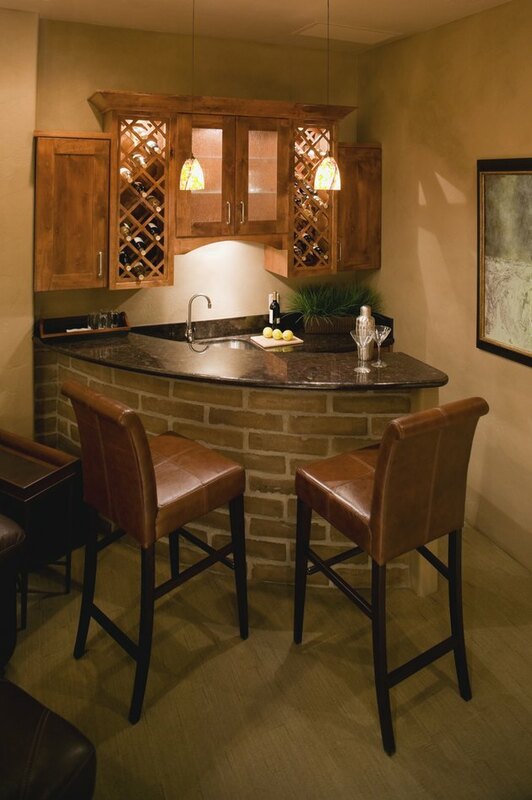 Most home bars are 42 inches high, including the countertop, which is typically about 2 inches thick. That height is appropriate for guests standing or sitting on standard bar stools. The depth should be 20 to 30 inches, depending on available space in the room, with an overhang on the countertop extending an additional 10 to 12 inches to accommodate bar stools. The width of the structure depends primarily on how many people will gather at a time, but most home bars are 6 to 8 feet long, allowing 24 inches per person so three or four people could sit or stand comfortably.